Last night, on the release date of his major label debut Long.Live.A$AP, A$AP Rocky debuted on the Late Show With David Letterman stage in as grand a fashion as possible. 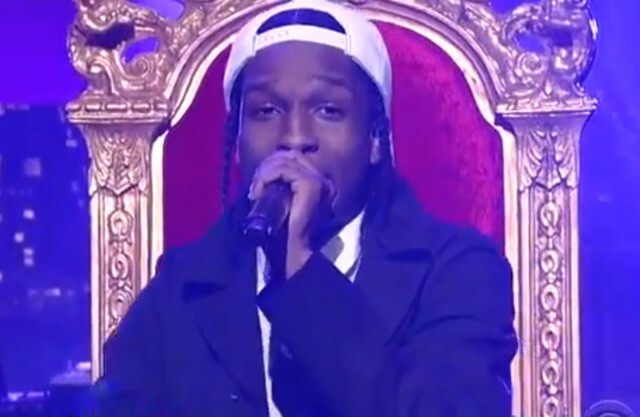 Rocky started out his performance perched on a throne, rapping the album’s title track. But after the first chorus, the throne disappeared and revealed an absolutely nuts troika of DJ/producers: AraabMuzik, A-Trak, and veteran O.G. DJ Clark Kent, all adding a storm of MPC thunder and turntable wikities to Rocky’s blaring Skrillex collab “Wild For The Night.” Watch the insanity below. Long.Live.A$AP is out now on RCA.